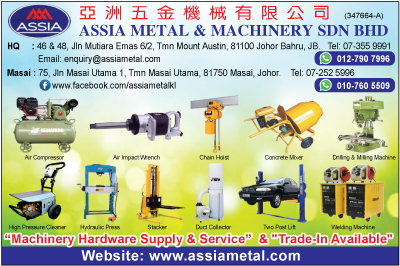 Assia Metal & Machinery Sdn Bhd is the first and only professional automotive supplier in Southern Malaysia, who was a leading services provider for automotive and industrial supplies. Our main office is located in Johor Bahru (JB), Malaysia. The company has a number of core businesses, each representing a pillar of growth. Our clientele is wide spread across many sectors ranging from Governmental, Manufacturings, Telecommunications, Defence, Educational Industries, Professional Automotive Service Providers, Automotive Racing Teams right down to DIY Enthusiasts and many more.